April 3, 2019 By Jonathan Kilburn & filed under Against All Odds, All Articles, More…. Rocks underfoot may not be the best environment to build a shelter, though proper water drainage and brick make this potential shelter site worthwhile. Tarp blocks possible wind entering from holes in fence. Short overhang gives additional wind resistance when needed. Many books and classes teach the importance of building and maintaining a shelter in the wild. Harvesting deadfall, cutting trees, and lashing logs together are all essential elements of building an emergency shelter, but what about in an urban environment? Urban areas are growing rapidly. As cities develop, people spread out and vast metropolitan complexes arise. These areas are harsher than many realize, especially in colder climates. In the case of a disaster or vehicle breakdown, it may be necessary to “hunker down” and construct a small shelter to protect yourself from the elements. In most cases, urban environments will not remain the chief stay point for individuals, but rather a temporary location. Bushcraft, survival skills, and tools are still essential in urban environments. The 5 Cs (Cover, Cordage, Container, Cutting, and Combustion) remain necessary to an individual’s general well-being. One of the core components of survival is using every item to your advantage. While the surrounding landscapes of wilderness and urban environments may be distinctive, the premise is exactly the same. Outside of that, some street smarts are a must to avoid being robbed or harassed. Even trash on the ground can potentially be utilized. While removing broken glass shards, author discovered a strap buried under the ground that may be very useful later. One main difficulty in sheltering in a city is the litter. Glass and metal are often found on the ground and in nearby spaces. Metal screws, shattered bottles, old tires, and even cars can quickly turn into new landmarks. It’s essential to inspect the ground or shelter site and clean dangerous litter out of the area. Another challenge of sheltering in urban environments is obtaining the proper materials. Try to avoid areas that aren’t near supplies. If materials are not prepared, it can be difficult to find them. Since cities don’t support many trees, there’s little possibility of procuring deadfall to make your own shelter. This is one of the key reasons a tarp is an essential survival tool in all environments. Dangerous materials are ever present in populated areas. Gasoline, oil, asbestos, rusted nails, and other items need to be avoided. Scanning for these items or things containing them will ensure better safety. For example, aboveground propane tanks look quite different in many cities and are great for attaching a shelter but dangerous when building a fire. While many items can be added to a kit for an urban environment, staying lightweight is important. A tarp or some type of makeshift shelter material should be carried at all times. My choice has been an Etowah Gear 8×10 silnylon tarp. Standard survival gear like cordage, cook set, blanket, headlamp, hatchet, and knife are still recommended. There shouldn’t be any considerable differences between an urban kit and a bushcraft kit. At dusk, author set up Polish Tarp Shelter with opening facing the brick wall and a woodburning stove. At night, shelter will be nearly impossible to see. Two key pieces of gear I always carry in my kit are a vintage Polish Poncho Shelter Half—which has the dual purposes of being a shelter and rain poncho—and a wool blanket. Periodically, I carry an entire Polish Shelter for more space and heat during the colder months. These two pieces of gear can be used as they are in the forest, but blend well in an urban nightscape. I frequently carry a portable wood-burning stove in a backpack. This is for ease of cooking and ability to contain a fire when surrounded by potential or unknown hazards. While not necessary, it does offer flexibility and can easily be carried out to a campsite or stored in a vehicle for emergencies. 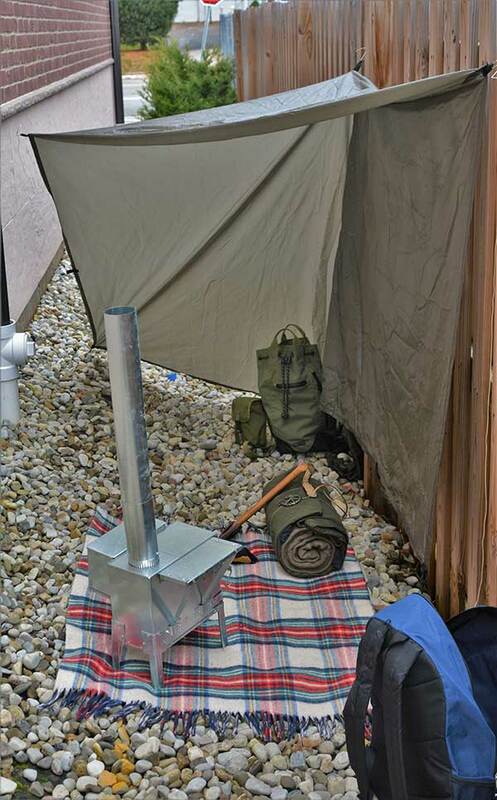 A Riley Stove allows me to cook, prep, and boil water all at the same time. It weighs about eight pounds. Stealth is one of the distinguishing characteristics of an urban shelter. These shelters are usually made from easy-to-pack materials and can be moved in a short amount of time. They should blend in well with the environment. Rigid lines and boxy shapes are at home inside a city. One reason to include a dark poncho is to remain as inconspicuous as possible. The drab green color is difficult to see. There is a fine line between stealthy and creepy. In urban environments, creepy quickly gets a visit by the police or a hostile neighbor, while stealthy will result in peace and silence. Partially secluded garden areas are easy to ignore or pass by. This small area is covered on all sides by a fence and may make an excellent spot to set up a shelter. Likewise, the way gear is carried should also be inconspicuous. Being surrounded by people gives more possibilities of overly inquisitive eyes. Carrying a knife or hatchet on your belt is a surefire way to be spotted, followed, and potentially robbed. “Gray-man” skills should constantly be employed. However, stealth is not always necessary, for example in a natural disaster or blackout. When a large number of people are displaced, shelters begin to emerge in uncommon places. It’s safe to assume that during these temporary periods, the need for stealth can mostly be ignored. It’s still a good idea to keep your supplies close by and your skills hidden to avoid thieves. 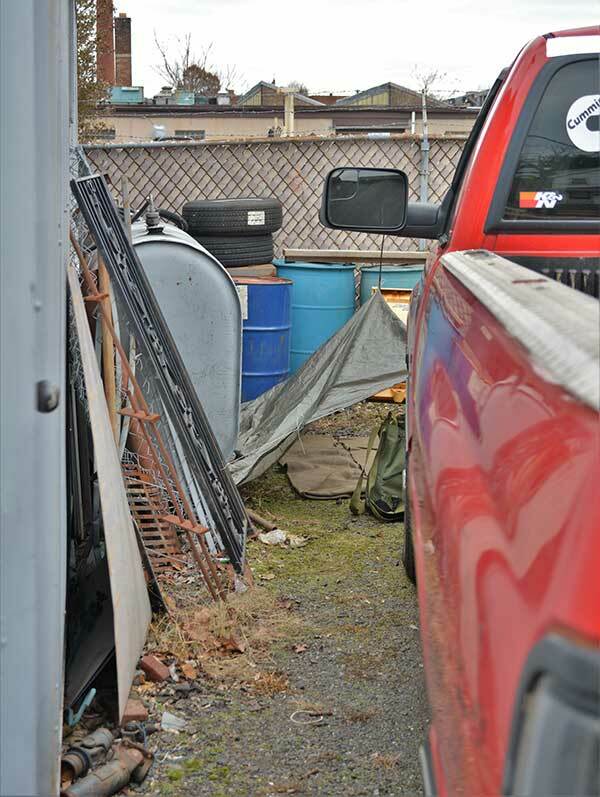 Small auto shop dump makes perfect inconspicuous campsite. Most cities have areas of overgrowth and vegetation. Many times, buildings are abandoned and left to rot until a city decides to tear them down. 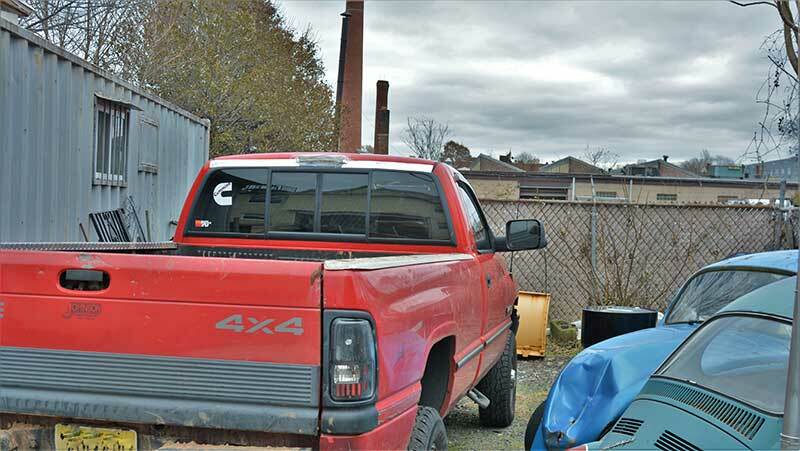 As time goes on, people get used to the barren lot and it has the potential to become a local dumping ground. These areas are ideal for remaining unseen. A relatively modern trend in a developing metropolis is buildings that are close together but not touching. These areas are ideal for setting up a shelter without being spotted or watched. This does limit the shape and design of a shelter—it’s challenging to mount a shelter to a featureless wall. Brick and stone materials are excellent for thermal mass and heat reflection. A brick or stone wall can reflect heat back into a shelter for a prolonged period of time. 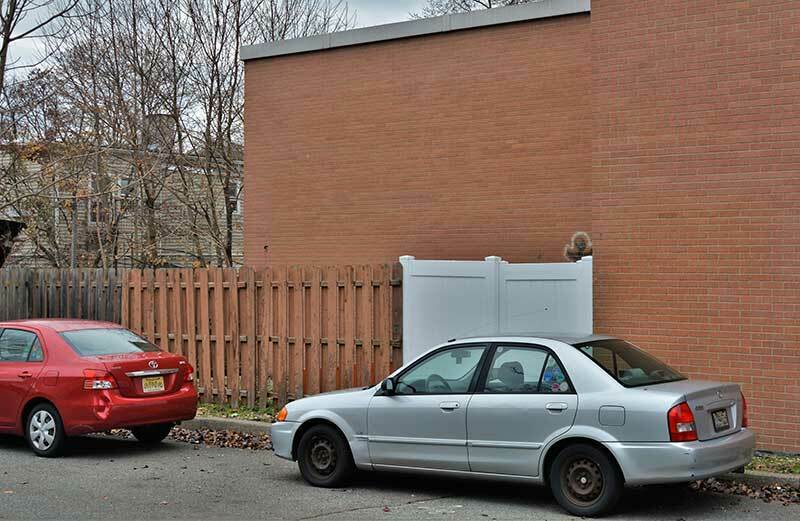 A suitable wall can also provide extra coverage from the elements and prying eyes. Setting up or taking down a shelter mid-day will raise some eyebrows and ruin the element of stealth, unless stealth isn’t needed. Assembling a camp at dusk will allow enough light to put it together just before nightfall. This is another reason to have a shelter that can easily be put up or taken down. It’s best to take a shelter down just after sunrise, while others are getting ready for their day. Being able to scan the environment is essential for safety. This shelter still has an opening to the side that allows its user to see anyone approaching from the side of the truck. There is never a perfect setup in these types of environments. With a lack of drainable soil, flooding and wet surfaces are givens. But cities are good at moving water quickly and providing drainage close to buildings. This usually means there is no soft surface to set up on. Anyplace that is reasonably quiet will work well. Moving around often will counteract stealth, so it’s a good idea to have a fuel source nearby for heat. 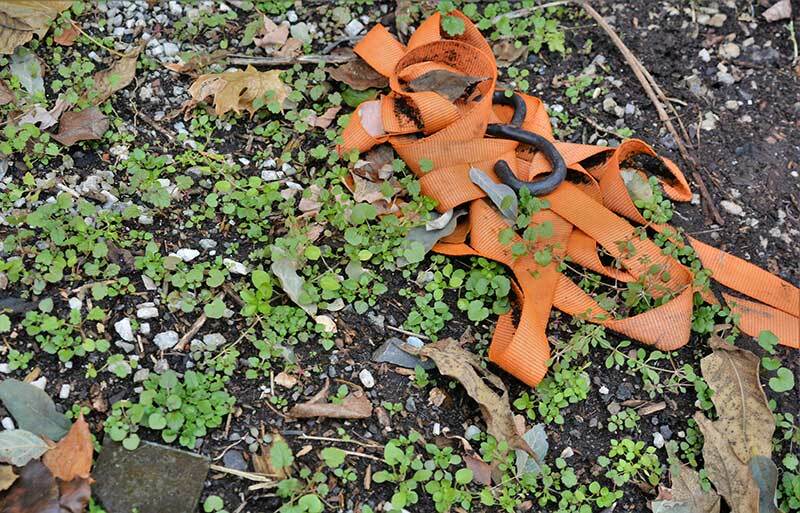 Debris from chopped limbs is not uncommon in these urban environments. Even wood from old buildings can be harvested as a fuel source. Areas that contain these elements are often undisturbed. Wind remains a concern. Buildings push and direct the wind, so setting up close to a wall helps eliminate the threat of air, radiates heat back, and offers some sense of security from prying eyes. 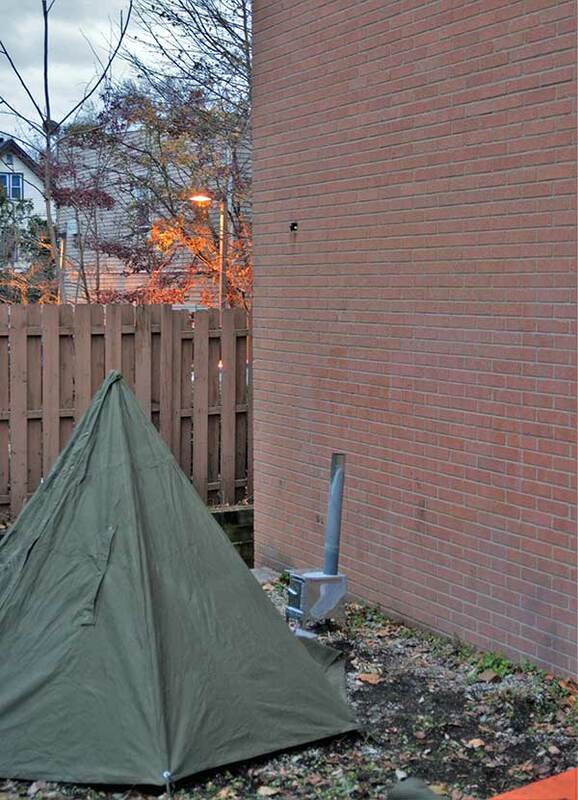 The purpose of an urban shelter is not to perpetuate an allure for homelessness or test the endurance limits of our inconvenience, but is a method of preparedness. After Hurricane Katrina, millions were displaced. During the Northern California Paradise Camp Fire, thousands camped outside in the parking lot of a Walmart. These events are scary, and stories of those unprepared for or ignorant of the circumstances were—and are—widespread. Knowing how to stay warm and dry in a metropolitan area when staying outside is worth its weight in gold if disaster strikes.